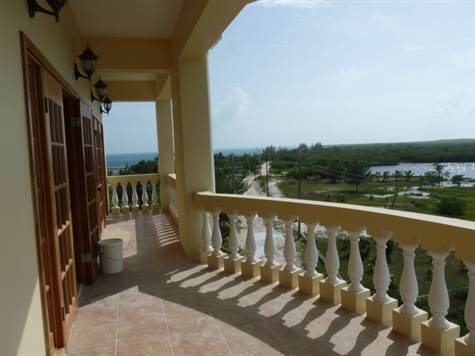 San Pedro, Ambergris Caye - If you are looking for the views this condo has them. It faces west and so has incredible views of the sunsets and the western side of the island and the Caribbean but it also has a balcony off the master bedroom that has incredible views of the ocean and reef. This 2 bedroom condo on the fourth floor has plenty of space and a very large veranda that spans the entire width of the condo. Solid concrete construction and mahogany throughout this condo can't be beat. The recession has caused a price reduction in this brand new condo that has never been lived in. The builders are putting the finishing touches on it as we speak and it should be open for use by September 1st.